Defender Ben Mee believes home advantage over their rivals could prove pivotal in the second half of the season. The Clarets take on Ipswich Town in their first outing of 2016 tomorrow, one of four teams currently in the Championship’s top six who have yet to visit Turf Moor this term. Sean Dyche’s side, who claimed a point against Brighton on home soil in November, have only taken a point from away trips to Middlesbrough, Derby County and Hull City. However, after registering successive 4-0 wins on their own territory, former Manchester City trainee Mee believes Burnley will ensure to make home comforts count. He added: “It’s a big game for us and we’ll look to put in another good performance. We’ll look to build on our last win and hopefully get another good result. 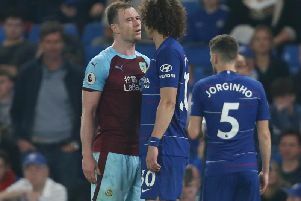 Mee was paired with Michael Keane at the heart of the Clarets defence for the triumph over Bristol City with Stephen Ward making his first start in 12 months at the expense of Michael Duff. And, after contributing to an eighth clean sheet of the campaign, Mee feels that the club are starting to find the right balance. “Obviously if we can replicate that we’ll be up there or thereabouts,” he said. “Keeping clean sheets is a good sign and banging in four goals is an even better sign. “Everyone wanted to prove something and put Boxing Day behind them. They wanted to get a good result which we did.